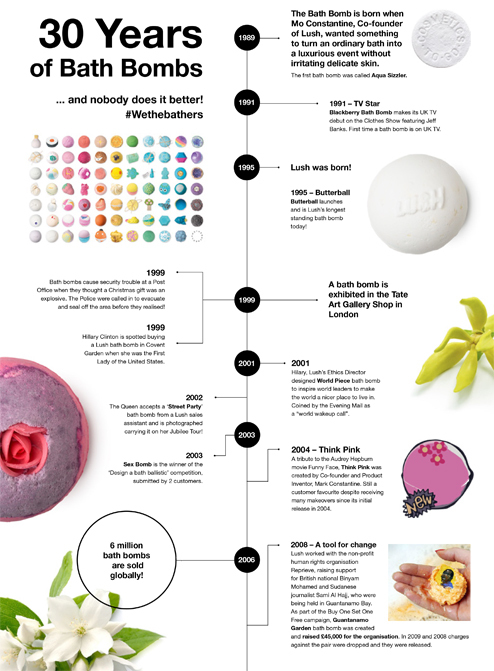 The bath bomb was invented by Lush way back in 1989, making this year its 30th birthday! Mo Constantine, Lush co-founder and product inventor, wanted something to turn an ordinary bath into a luxurious event without irritating delicate skin. 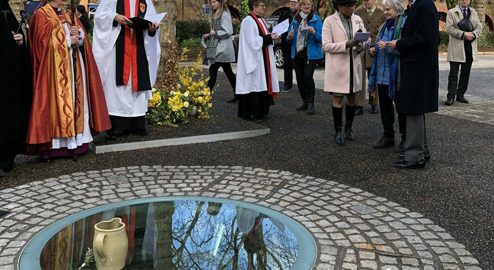 She worked from her garden shed, creating a product that softened water and brought essential oils and fresh ingredients to the bath in a whole new way. Since then, the bath bomb has been on quite a journey. 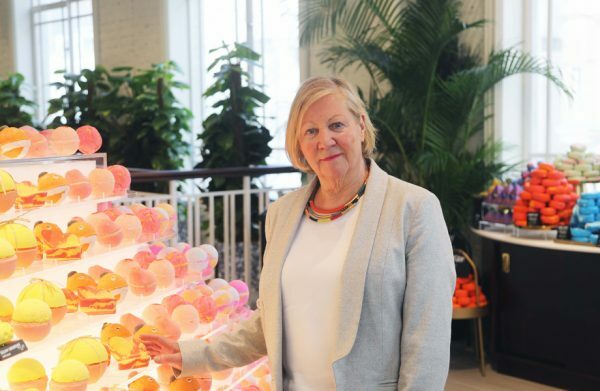 Mo and her son Jack have, together, experimented, invented and pushed the bathing boundaries with highlights including Butterball, a creamy bath bomb full of skin-softening cocoa butter; The Experimenter, which is an explosion of colour and creativity; the innovative Jelly Bomb, containing mineral-rich seaweed; and the opening of the world’s first digital bath bomb concept shop in Tokyo. Bath bombs have become a form of artistic expression. With the addition of 3D printing technology, even more colour, lustre and popping candy, these solid bicarb structures have evolved dramatically and when dropped into the tub, now offer multiple layers of benefits. Bath bombs continue to treat the skin to an abundance of rich butters and oils, creating a unique ambience in your bathroom through fragrance and colour and boosting the wellbeing of both mind and body thanks to the use of exquisite essential oils. They’ve been tools for change in many of Lush’s well-known campaigns and have more than a few celebrity admirers! 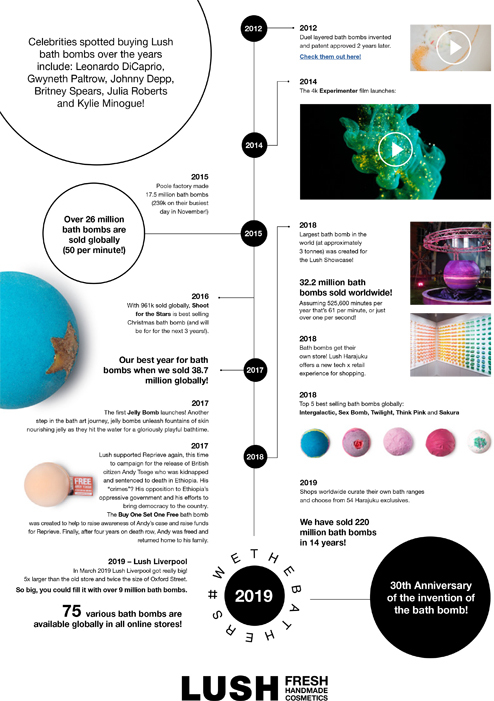 On 29 March 2019, Lush shops worldwide, including the one in Broadmead, Bristol, will be curating their own bath bomb ranges for the first time, choosing from 54 exclusive products (previously only available in the bath bomb concept shop in Harajuku, Tokyo) to sell in their own shops. Each shop will have a different selection with Bristol’s including Turmeric Latte and Black Rose bath bombs. They get to change their chosen range regularly, so have a look at the full menu HERE and let the team in store know if there’s one you’d like to see on their shelves!